If you can connect to your routers web interface using safari on your i device, then you can connect using this app. The most common problem people have, is using the wrong settings in the app. To get you up and running initially, make sure you are connecting locally to your router in which case you must be connected to the same WiFi as the router. 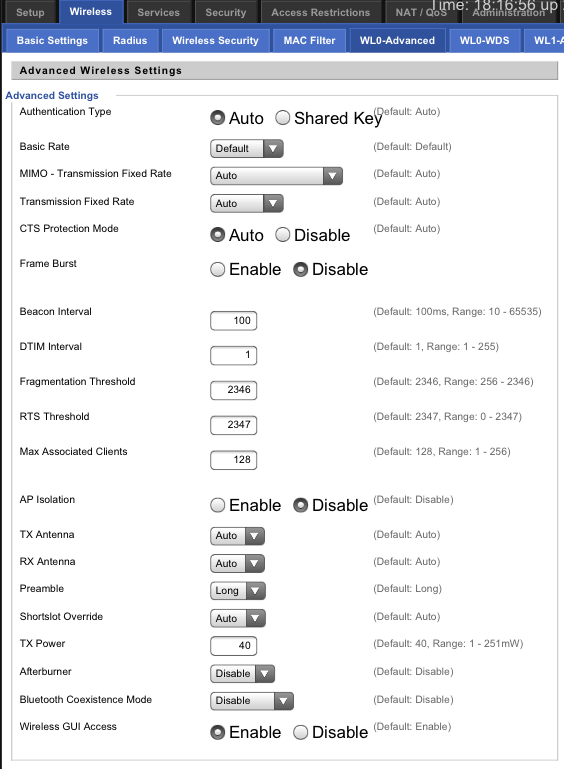 You can always add remote/DDNS settings later. First of all, you do have DD-WRT installed on your router don't you? If you are unsure, then your probably don't. I'm sure you would know if you flashed your router with 3rd party firmware. For local access, you only need to worry about the Web Access section. Make sure at least 1 of the protocols are selected and 'Enable Info Site' is Enabled. It shouldn't matter if 'Info Site Password Protection' is enabled or not, however not being able to connect with this enabled while connecting whilst disabled is a sure fire way of knowing you haven't entered the correct Username and Password in the Connection Settings explained below. Router IP address - This should be pretty obvious, it will normally be something along the lines of 192.168.1.1 or 192.168.0.1 and will be the same as what you enter into safari to view the web interface. Port - If you are connecting using http then this will be 80. If you are using https then it will be 443. Please note that the setting in the web interface at Administration->Management->Remote Access->Web GUI Port IS NOT what you enter here. That is the port that is used when you wish to connect remotely. (So you would enter it here if using a DDNS to connect remotely). Router login - DD-WRT can have more than 1 user. Mine has 2 set up by default! (admin & root). The username you need to enter here is the same username you use when the web interface asks you to log in. This is usually 'admin' but this can be changed. If you buy a router that's already flashed with DD-WRT then the chances are that the username has been changed. Please consult the seller. Router password - I can't help you here i'm afraid. When you first logged into dd-wrt it would have asked you to change your admin password. This is the same password you use to log into the web interface. As above, if you have a pre-flashed DD-WRT router, then please consult the seller for the password. 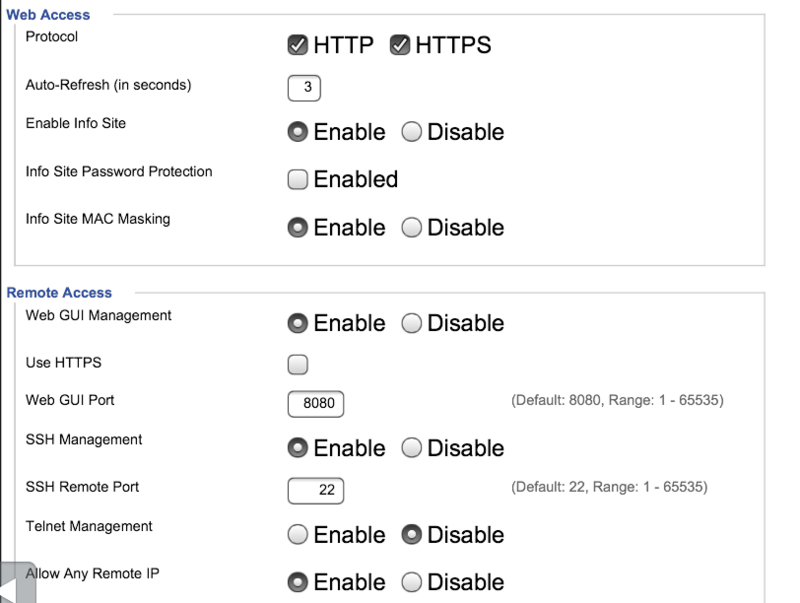 http/https - There is a setting in the web interface at Administraion->Management->Web Access->Protocol to choose between http, https or both. If you are unsure which to choose, you can always try both (But remember to enter the correct port 80 or 443). 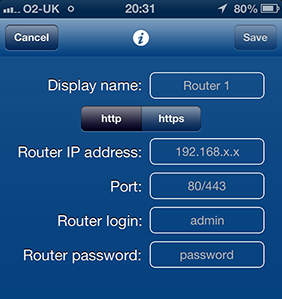 If you wish to use this app remotely (Away from your router and not directly connected to it's WiFi) then you need to know either your routers WAN IP address, or use a DDNS service like dyndns.org to get a direct connection to your router. You must also enter a port number for 'Web GUI Port' and make sure you use this port in the app settings. If you are still experiencing any problems with the app, please, please, please drop me an email with an explanation of your problem and I will do my utmost to help you. I really do have a lot of pride in the work I do and it frustrates me when I receive emails just saying "This app is rubbish, it doesn't work. Give me a refund" as it doesn't help either of us. Also leaving negative reviews on the App Store doesn't help anybody, as I cannot fix something if I do not know about it in the first place. I'm a friendly guy and I respond to every email I receive (Apart from the foreign ministers that need help tranfering millions of dollars). Please bear in mind that I am in the UK, so any emails received from abroad may not get a responce for several hours due to the time difference. Thank you for buying my app. I hope you enjoy using it as must as I enjoyed making it. Please leave a review on the App Store (iPhone/iPod) / (DD-WRT HD) as the more positive reviews I receive, the more I like to work on the app to improve it further.